CHICAGO (WLS) -- Street closures and changes to CTA and Metra schedules are in place as more than 40,000 runners are expected to take part in the Bank of America Chicago Marathon on Sunday. Motorists should be aware that some street and lane closures are already in place in the Grant Park area, including Balbo from Columbus to Lake Shore Drive. Additional street closures in the race day start/finish line area can be expected thereafter, beginning on Wednesday when Jackson was closed from Columbus to Lake Shore Drive. Columbus closures began Thursday, with a full closure implemented from Roosevelt Road to Monroe By Friday. By Saturday, expect additional Grant Park street closures on Columbus, Balbo, Congress, Jackson and Monroe, with most streets in Grant Park reopening by Monday morning. The race on Sunday, October 11 begins in two waves - one wave begins at 7:30 a.m. (CST), followed by the next group at 8:00 a.m. The race starts and finishes in Grant Park, with the route extending as far north to Addison Street, with the farthest west point at Damen Avenue and southern point at 35th Street. Street closures along the route will begin at approximately 7:00 a.m. on Sunday and are anticipated to be reopened by 4:30 p.m. or when it is deemed safe to do so. Beginning early Sunday morning, parking restrictions will be in effect along the course. For public safety and traffic flow, the towing of vehicles along the route and other posted "No Parking Zones" will be strictly enforced. Motorists are encouraged to read signage before parking and call 3-1-1 to locate a towed vehicle. For information on street closures, visit https://chicagomarathon.com/streetclosures. Metra will operate extra early morning inbound and early afternoon outbound trains on five of its rail lines to accommodate participants and spectators attending the marathon on Sunday. Extra service will be available on the BNSF, Metra Electric, Milwaukee North and Union Pacific North and Northwest lines. This service will operate in addition to regularly scheduled Sunday service. For specific schedule information, visit www.metrarail.com. As always, public transportation is encouraged if heading to the marathon or other destinations in the impacted areas. For more information on CTA services and reroutes, visit www.transitchicago.com or call 836-7000/1-888-YOUR-CTA. Blue Line: Longer trains will operate beginning 4 a.m. until 4 p.m. More frequent service also will be provided with trains operating every 5-6 minutes beginning 8:30 a.m. until approximately 3 p.m.
Red Line: Longer trains will operate beginning 5 a.m. until approximately 4 p.m. More frequent service also will be provided, with trains operating every 6-8 minutes between 5 a.m. and 6:30 a.m.; and every 5-6 minutes from 6:30 a.m. until 4 p.m.
Orange Line: Longer trains will operate beginning 5:30 a.m. until 3 p.m.
Green Line: Longer trains will operate beginning 5:30 a.m. until 3 p.m.
Purple Line: Service will begin earlier than normal, with the first train departing at 5:30 a.m. from Linden to Howard where customers can transfer to the Red Line trains for service to downtown. On Friday and Saturday, the CTA will operate increased service on the #3 King Drive route for the 2015 Chicago Marathon Health & Fitness Expo at the McCormick Place Convention Center. Extra service will begin each day at approximately 7:40 a.m. until approximately 10 p.m. Friday night and 8 p.m. Saturday night. For the 2015 Chicago Marathon, the CTA will operate the Yellow Line Shuttle earlier, with the first trip departing Dempster-Skokie at 5:40 am. The free shuttle buses serve all Yellow Line rail stations (Dempster-Skokie, Oakton-Skokie and Howard). 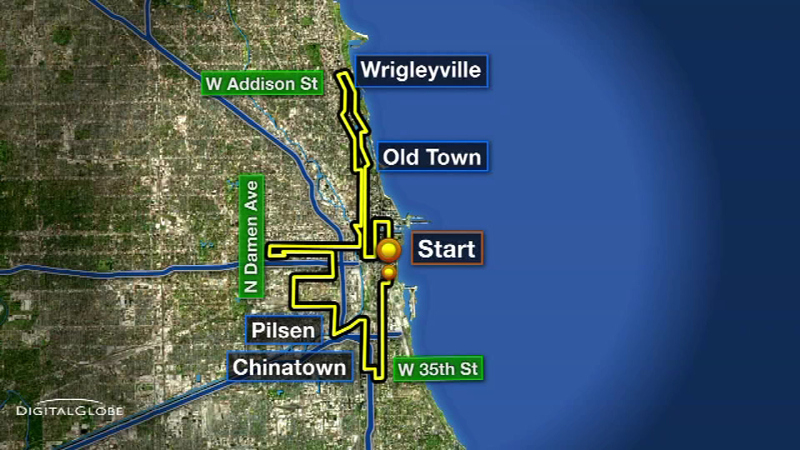 Along the course of the race, there will be intermittent reroutes on several CTA bus routes. Reroutes can be expected in the downtown area from 6:30 a.m. until 4 p.m.; on the North Side from 6:30 a.m. until noon; on the West Side from 7 a.m. until 2 p.m.; and on the South Side from 6:30 a.m. until 4 p.m. All times are approximate and detours will be determined by Chicago Police and CTA supervisory personnel.